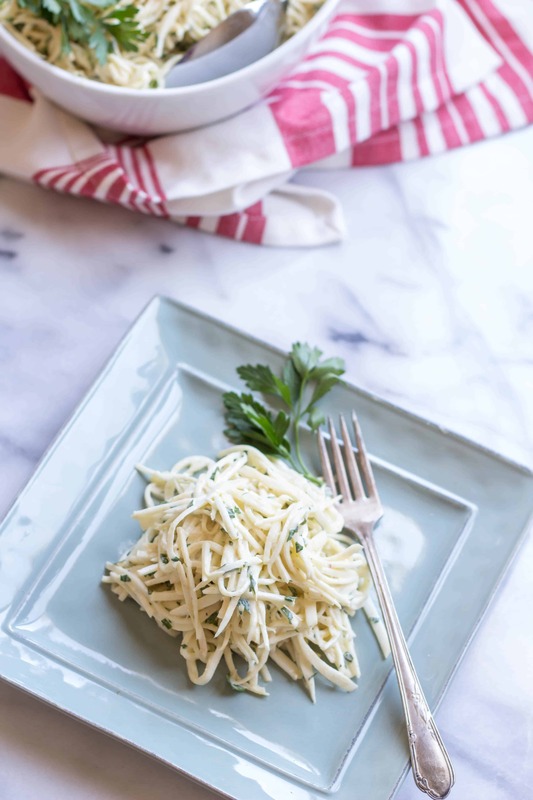 Celery Root Remoulade is a crisp and refreshing side to serve with sandwiches, meats, fish, and more! Consider it a fancy cousin of Coleslaw – it has a unique taste unlike anything you’ve ever tried! Celery root remoulade can best be described as a fancy French cousin of cole slaw. I first fell in love with remoulade when I lived in Louisiana, but it wasn’t until recently that I realized the Cajun version is a lot different than the classic. French remoulade is much more subtle, and is typically tossed with crisp celery root and served as a salad. Celery root, or celeriac as it’s sometimes called, is a curious vegetable. It’s literally the root of the celery plant, and has a slightly sweeter, more mellow celery flavor. The texture, however, is completely different. It’s dense and crisp, similar to a raw carrot or beet. It throws you off at first, but then you can’t help but love it. Celery root cooks up beautifully, but I’ve really become partial to eating it raw. Sliced into thin matchsticks and mixed with creamy remoulade and a shower of fresh herbs, this is simple French food at it’s best. Whisk together the mayonnaise, Dijon mustard, lemon juice, vinegar, heavy cream, salt and pepper. 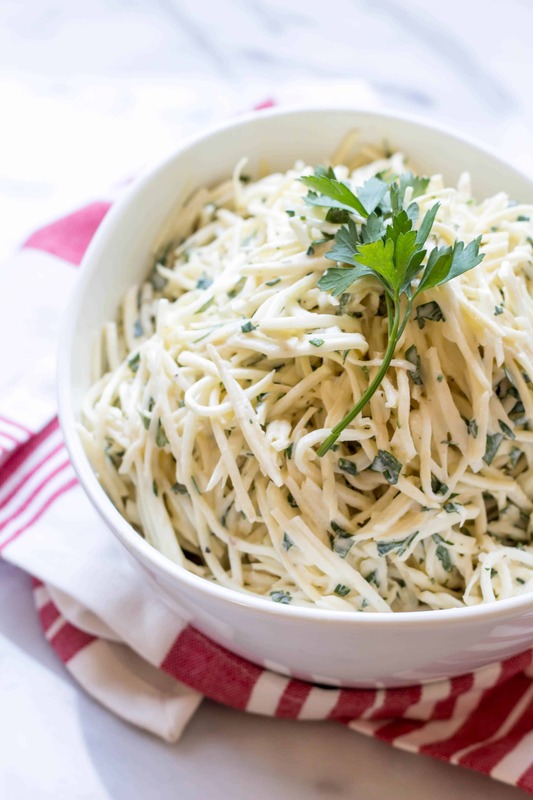 Gently fold in the julienned or grated celery root, parsley and chives. Taste, and adjust seasoning as needed, adding more salt, pepper, lemon or mustard to suit your taste. Cover and refrigerate for 30 minutes to let the flavors meld before serving. Salad will keep refrigerated for up to two days. If making ahead, leave out the herbs and stir them in right before serving. I only recently started eating celery root (I didn’t even know you could), and I absolutely love it! I can’t wait to make this salad on Sunday!!!!! !